Why is it slow ? The virtual machine layer that abstracts Java away from the underlying hardware increase the overhead. These overheads can cause Java application to run slower that an equivalent application written in a lower-level language. Java’s advantages platform-independence, memory management, powerful exception checking, built-in multi-threading, dynamic resource loading and security checks add costs. Performance tuning is similar to playing a strategy game. Your target is to get a better score than the last score after each attempt. You are playing with, not against, the computer, the programmer, the design, the compiler. Techniques include switching compilers, turning on optimizations, using a different VM, finding 2 or 3 bottleneck in the code that have simple fixes. The first step in the tuning is to determine which of these is causing your application to run slowly. When you fix a bottleneck, is normal that the next bottleneck switch to another limitations. 2.Choose the quickest and easiest one to fix, and address it. – once a bottleneck has been eliminated, the characteristics of the application change, and the topmost bottleneck may no need to be addressed any longer. 1. 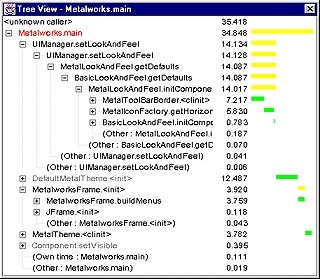 Measure the performance by using profilers and benchmark suites. 2. Identify the location of any bottlenecks. 3. Think of a hypothesis for the cause of the bottleneck. 4. Consider any factors that may refute your hypothesis. 5. Create a test to isolate the factor identified by the hypothesis. 9. Repeat from Step 1. The users has a particular view of performance that allows you to cut some corners. Ex : A browser that gives a running countdown of the amount left to be downloaded from a server is seen to be faster that one that just sits here until all the data is downloaded. if application is unresponsive for more than 2 sec, it is seem as slow. How to appear quicker ? Threading : ensuring that your application remains responsive to the user, even while it is executing some other function. 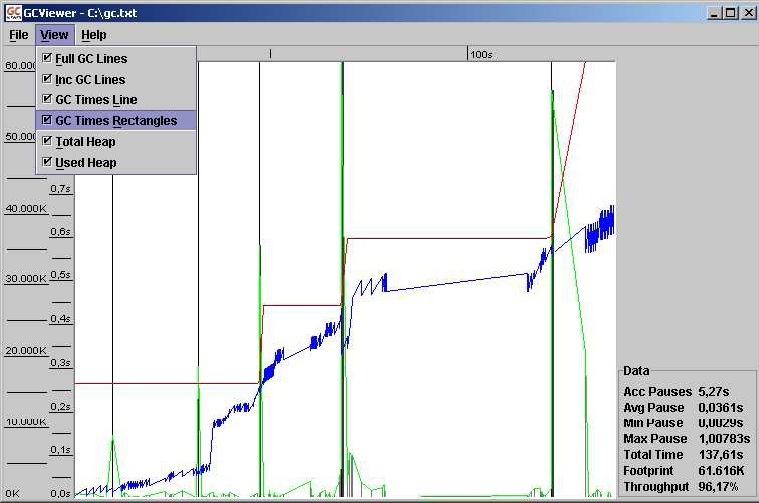 Streaming : display a partial result of the activity while continuing to compile more results in background. (very useful in distributed systems). Caching : the caching technics help you to speed the data access. The read-ahead algorithms use in disk hardware is fast when you reading forward through a file. Setting benchmarks : these are precise specifications stating what part of code needs to run in what amount of time. How much faster and in which parts, and for how much effort ? Each run of your benchmarks needs to be under conditions that are identical as possible. The benchmark should be run multiples times, and the full list of results retained, not just the average and deviation. Run a initial benchmark to specify how far you need to go and highlight how much you have achieved when you finish tuning. Any profiler slow down the application it is profiling. Using currentTimeMillis() is the only reliable way. The OS interfere with the results by the allocation of different priorities to the process. On certain OS, the foreground processes are given maximum priority. Some cache effects can lead to wrong result. Some of the commercial profilers provide statistics showing what the garbage collector is doing. Or use the -verbosegc option with the VM. The printout includes explicit synchronous calls to the garbage collector and asynchronous executions of the garbage collector when free memory available gets low. -the number of bytes reclaimed by the garbage collection. 1. Show where the bottlenecks in your code are and helping you to decide where to target your efforts. 2. Most method profilers work by sampling the call stack at regular intervals and recording the methods on the stack. 3. The JDK comes with a minimal profiler, obtain by using the -Xrunhprof option (depends on the JDK). This option produces a profile data file (java.hprof.txt). -a bargraph of the time. -All the methods that the current method itself invokes are listed in the caller pane. Identifying where particular objects are created in the code. The JDK provides very rudimentary objectcreation statistics. Use a commercial tool in place of the SDK. 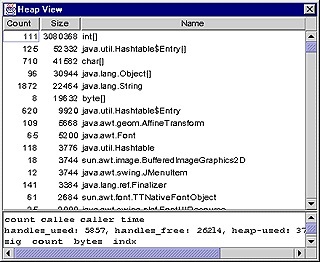 the amount of memory used by the runtime system : freeMemory() and totalMemory() in the java.lang.Runtime class. totalMemory() returns a long, which is the number of bytes currently allocated to the runtime system for this particular VM process. freeMemory() returns a long, which is the number of bytes available to the VM to create objects from the section of memory it controls. Tuning IO performance H The example consists of reading lines from a large files. Set the size of the buffer to 8192 bytes. Use Readers instead of InputStreams, according to the Javadoc, for full portability, etc. Let’s get down to some real tuning. You know from general tuning practices that creating objects is overhead. Up until now, we have used the readLine() method, which returns a string. Suppose we avoid the String creation. Better, why not working directly on the underlying char array. We need to implement the readLine() functionnality with our own buffer while passing the buffer to the method that does the string processing. Our implementation uses its own char array buffer. It reads in characters to fill the buffer, then runs through the buffer looking for ends of lines. Each time the end of a line is found, the buffer together with the start and end index of the line in that buffer, is passed to the doSomething() method. This implementation avoids both String-creation overhead and the subsequent String-processing overhead. Better, performing the byte-to-char conversion. Change the FileReader to FileInputStream and add a byte array buffer of the same size as the char array buffer. Create a convert() method that convert the byte buffer to the char buffer.